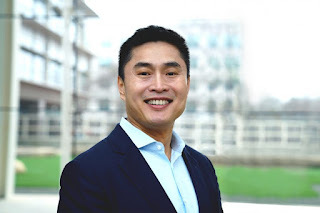 Pine River Capital Management’s Dan Li was up 14 percent last year through November betting on China’s ability to bring more investors into its stock market. He more than doubled that gain in December, returning 30 percent for the year as Shanghai equities surged. Li wasn’t the only hedge fund manager ending 2014 on a high. Mark Carhart’s $2 billion Kepos Capital rose 7.8 percent in the final month to finish 2014 up 22 percent and Pierre Andurand’s energy hedge fund rocketed 15 percent in December after climbing 18 percent the prior month, according to people with knowledge of the returns. The final two months of 2014 made the year for some managers who were able to navigate plunging oil prices, surging stock-market volatility and a rising dollar, catapulting these firms to returns of 20 percent or more. In the case of billionaire Paul Tudor Jones, his year-end trading saved him from marring a record of only one losing year since 1986 in his largest fund. For billionaire John Paulson, it just made a bad year worse. The strong performance for some came as hedge funds, on average, barely made money, climbing 1.4 percent for the year, according to data compiled by Bloomberg. Like other funds that use computer models to make trading decisions, Carhart’s Kepos Alpha Fund caught the big market moves in the last two months of the year, said a person with knowledge of the firm, who asked not to be identified because the information is private. Carhart started New York-based Kepos, named for the philosopher Epicurus’s school in ancient Greece, in 2010 after he was co-chief investment officer of the quantitative investment strategies group at Goldman Sachs Asset Management. On average, so-called quant funds rose 20 percent last year, according to the Newedge Trend Index. Jim Simons’s Renaissance Technologies, one of the biggest quantitative firms with $26 billion under management, posted a 1 percent gain in December in its Institutional Equities Fund, extending its advance for the year to 15 percent, the person said. Macro funds, which as a group struggled throughout most of the year, benefited from increased price gyrations in November and December. Oil prices fell by a third in the two months, ending the year around $50 a barrel, and stock volatility, as measured by the VIX index, rose as high as 24 in December, compared with 14 on average for the year. The dollar climbed against the euro and the yen as the U.S. economy strengthened and the Federal Reserve indicated it may raise interest rates this year. Jones’s $13 billion hedge fund firm Tudor Investment Corp. completed the year up 3.2 percent, reversing a 0.5 percent loss through October, according to a person with knowledge of the returns. Louis Bacon’s $15 billion Moore Capital Management finished 2014 up 1.7 percent through Dec. 24 in its Global Investments fund, recovering from a 1.2 percent decline in the first 10 months, said another person. Discovery Capital Management’s Robert Citrone ended 2014 down 3.2 percent, paring a 17 percent loss through mid-October. Multistrategy firms such as Pine River, Eton Park Capital Management and Balyasny Asset Management were able to make money across asset classes. Li’s Pine River China Fund, which trades stocks, convertible bonds and credit, posted a 30 percent gain in 2014, according to a person with knowledge of the returns. The fund was helped largely by the linkage of the Shanghai and Hong Kong stock exchanges, which for the first time allowed international investors to buy Shanghai-listed equities without a qualified foreign institutional investor quota, causing a rally in shares in November and December. Eric Mindich’s $9 billion Eton Park also profited from its main fund’s China-related holdings in December, when it gained 1.1 percent, said a person familiar with the matter. The fund rose 6.4 percent in 2014. Balyasny, the $7.4 billion Chicago-based firm run by Dmitry Balyasny, navigated energy trading in its specialized Zie fund, which jumped 6.4 percent in December and 19 percent last year, according to a person familiar with the returns. The firm’s Atlas Global and Atlas Enhanced funds, which trade more broadly, climbed 7.2 percent and 14 percent in 2014. For John Paulson’s Paulson & Co., 2014 couldn’t end soon enough. Paulson suffered his second-worst year ever, as his event-driven and credit funds -- which account for $7.8 billion of his $19 billion in assets -- plummeted. His Advantage Plus fund, once the firm’s flagship strategy, fell 36 percent. In 2011, that fund, which bets on corporate events like bankruptcies and mergers and uses borrowed money to amplify returns, was down 51 percent. Officials for the firms declined to comment on the returns. One of the worst-performing funds in 2014 were ones managed by John A. Paulson, who rose to fame by making billions of dollars from a shrewd bet against the United States housing market in the run-up to the financial crisis. But ever since, Mr. Paulson’s $19 billion firm, Paulson & Company, has posted uneven returns. The Paulson Advantage Plus fund was down nearly 22 percent at the end of November, according to the HSBC report. And the Paulson Recovery Fund was down 15 percent during the same period. 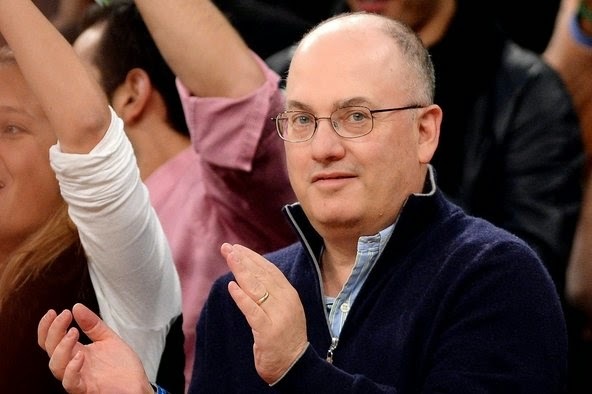 Not surprisingly, Steve Cohen delivered outstanding returns in 2014. One thing you have to know about the perfect hedge fund predator, he doesn't have a CFA, fancy degrees or a great vocabulary but he's one of the best traders in the world and thrives in these volatile markets. Importantly, when it comes to printing money, Steve Cohen remains one of the best of the best regardless of his tarnished reputation from the insider trading scandals at SAC Capital. He now runs his own money and I track his moves closely every quarter when covering top funds' activity but never ever buy what he's buying because he churns his portfolio too often (most of the times you are better off shorting what he is supposedly buying). But there were other stellar hedge fund performers in 2014. I already covered Bill Ackman's Pershing Square in July when I went over mid-year winners and losers. I also covered him when I discussed oversized hedge fund egos and why you should avoid the hottest hedge funds. He's an excellent hedge fund manager but I doubt he will produce anything close to what he delivered in 2014. As far as Paulson, his disadvantage minus fund keeps struggling and he remains one of many poster children for the rise and fall of hedge fund titans. But he made so much money in the 2008 crisis that he doesn't need to worry too much about redemptions, he has enough staying power and if worst come to worst, he'll manage his own money like Cohen and others. While I disagreed with his "long gold" call last year, it might pan out this year if the ECB starts cranking up its QE but the mighty greenback will limit its bounce back. Paulson's fund made a few great calls in 2014, like buying Vanda Pharmaceuticals (VNDA), but got killed on Shire (SHPG) like so many others. That’s a good deal for Jefferson, 49, who has been profiting from bankers’ blunders for more than a decade. His hedge-fund firm, Stamford, Connecticut–based Hildene Capital Management, vacuums up complex securities when others are shunning them as toxic junk. So does Michael Craig-Scheckman’s Deer Park Road Corp., Bloomberg Markets magazine will report in its February issue. “We make money because people on Wall Street make mistakes,” says Craig-Scheckman, 62, whose firm is based in Steamboat Springs, Colorado. Six years after the 2008 debt crisis exposed how clueless the smart people on Wall Street can be, both men are profiting from what could be called the schadenfreude trade -- buying for pennies what big investment banks once flogged for dollars. Their bottom-fishing lifted them into the top five of Bloomberg Markets’ annual ranking of the best-performing hedge funds managing $1 billion or more. Craig-Scheckman’s STS Partners Fund, up 23.9 percent in the 10 months ended on Oct. 31, took third place. Jefferson’s Hildene Opportunities Fund, up 23.6 percent, came in fourth. Ackman was an outlier. Most managers on the list were debt traders, including a dozen funds dealing in bonds backed by mortgages and other assets, or quants -- investors who use mathematical models to trade a variety of securities. It was debt trading that powered the best quant fund on the list: Quantedge Global, which ranked No. 2, with a 32.3 percent gain. The firm is a group of hypereducated actuaries, most of them in Singapore. The 15 people on Quantedge’s investment research team hold degrees in math, economics, finance, financial engineering and physics from Harvard University, the University of Pennsylvania’s Wharton School, the University of Oxford, the University of California at Berkeley and the Massachusetts Institute of Technology. They trade everything -- stocks, bonds, currencies, commodities and insurance-linked securities such as catastrophe bonds, where their actuarial skills come in handy. Yet it was fixed income that drove gains in 2014, a Quantedge Capital spokeswoman said in an e-mailed response to questions. Mortgage funds did well in 2014 because home prices rose and fewer debtors missed payments on their loans -- including the subprime borrowers whose debt hedge funds love. At the end of the third quarter, 18.8 percent of subprime home loans were delinquent, down from 27.2 percent in March 2010, according to the Mortgage Bankers Association. Bonds backed by home loans rallied for the fifth year, making analysts wonder how long the good times will last. “Everyone thought mortgages were over,” says Chris Acito, chief executive officer of Gapstow Capital Partners in New York, which has $1.1 billion invested in hedge funds that trade credit. Yet the party goes on. “If people haven’t defaulted on these yet, they probably won’t,” Acito says. Better yet for the sketchy-debt crowd: There aren’t enough old bonds to go around, Acito says. When prices get low enough, Wall Street’s gaffes turn into gold. And with more homeowners paying their mortgages, that gold is going platinum. Hedge funds as a group had a horrendous 2014, with an average return of just 1.6 percent through October among the 2,400 funds that make up the Bloomberg Global Aggregate Hedge Fund Index. Until October, managers complained that volatility in stocks and bonds made it tough to make money. Then, many got spooked and sold during October’s plunge, missing a quick profit as prices rebounded. Some of the largest and best-known funds, caught up in crowded trades that went against them in October, lost the most. The preferred shares of U.S. government–controlled mortgage aggregators Fannie Mae and Freddie Mac were favorites among hedge funds, and they tumbled more than 50 percent when a court ruling went against investors. Merger-arbitrage managers lost big when drugmaker AbbVie Inc. (ABBV) dropped a plan to buy Shire Plc (SHPG) and Shire shed more than a quarter of its value in two days. John Paulson, who had five funds in the top 100 in 2013, was among the biggest losers in 2014. His $19 billion firm, Paulson & Co., lost money in both Fannie-Freddie and AbbVie-Shire trades. His Advantage fund plunged 14 percent in October and 25 percent for the year as of Oct. 31. The flagship fund of Claren Road Asset Management, majority owned by private-equity firm Carlyle Group LP (CG), dropped 9.1 percent in the 10-month period on the Fannie Mae and Freddie Mac trade. Two funds that did not make the top 25 nevertheless were the most profitable. No. 26 Viking Global Equities led that list, pulling in $573.3 million in incentive fees for the 10 months ended on Oct. 31. Israel “Izzy” Englander’s Millennium International made $389.5 million even though it tied for 75th in performance, with a 7.4 percent return. The top midsize fund, with assets from $250 million to $1 billion, was the Mauritius-based India Capital fund, run by Jon Thorn, which was up 47.2 percent in the ten months ended Oct. 31, after falling 21.7 percent in 2013. STS’s Craig-Scheckman floated through October’s volatility. He and Deer Park Road Chief Investment Officer Scott Burg, a former offensive guard on the University of Colorado football team, buy mortgage-backed bonds that pay a healthy yield, and they are ready to hold them long term. Even if prices decline, they clip their coupons. And if it snows, they go skiing. Craig-Scheckman is in the midst of constructing a new office building for his 19 employees at the base of the gondola at Steamboat Springs. They all get lockers and a ski pass as perquisites. If fresh snow lures them out at midday, they bring their mobile phones to complete trades. In 1978, Craig-Scheckman left physics and joined them in finance. He traded gold, then mortgage bonds. In 1993, he went to work for Englander’s Millennium Management. Craig-Scheckman started Deer Park Road in 2003, moving his family to Steamboat Springs that same year. Mortgage bonds that were minted from 2004 to 2007 are among Craig-Scheckman’s favorites. That’s when lenders offered negative-amortization mortgages, in which the payments didn’t cover all the interest, so the principal just kept growing. “These were the worst possible loans people could take,” he says. Lately, they’ve been among the best for Deer Park Road. Bonds backed by them tumbled so much that a little improvement in payment on the underlying loans boosts their value. Hildene Capital’s Jefferson trades exotic stuff too, and he does it without a physics degree. He grew up in Rye, New York, the son of a container-ship captain. More jock than geek, he majored in English and played lacrosse for Syracuse University in 1988 when it won the national championship. He played on a club team while working on an MBA from the Kellogg School of Management at Northwestern University. Jefferson started his career in structured debt in 1997, when his bosses at Salomon Smith Barney asked him to figure out a new category of securities called collateralized loan obligations -- bundles of corporate loans structured as securities. Back then, a little experience made him an expert, he says. He joined Marathon Asset Management in 2002 and ran the Marathon Structured Finance Fund until 2006. Under his watch, the fund never had a money-losing month, according to fund documents. Even so, he and Marathon CEO Bruce Richards parted ways. “Mr. Richards and I had a disagreement,” Jefferson says, declining to say more. Jefferson spent the next two years sitting out the excesses of the mortgage bubble. “I made the smartest investment decision of my life by not working in 2006 and 2007,” he says. He started Hildene in mid-2008 after subprime mortgages had collapsed and securities built from them, called collateralized debt obligations, plummeted. Of particular interest were bonds issued by banks and backed by trust-preferred securities. They’re called TruPS CDOs, and specializing in them is a little like being a connoisseur of wine from Canada: There isn’t much of it, and it’s hard to make, but it can be superb if the growing season is good. TruPS CDOs are made from a kind of debt that U.S. banks started selling in earnest in 1996. That year, the Fed let bank holding companies raise capital by selling special securities to investors. The notes paid dividends, like preferred stock, and allowed the banks to treat those dividends like interest payments, which are tax deductible. Better yet, the securities counted toward regulators’ strictest capital requirements. To participate, a bank would set up a subsidiary -- the trust -- to sell the securities to investors. The trust would then loan the proceeds of those sales to the bank and use the bank’s interest payments to provide dividends to investors. Wall Street eventually got involved and started bundling the trust securities into CDOs, as they did with every other kind of debt. Citigroup Inc. created the first TruPS CDO in 2000. This was a big development for small banks. Before the CDO deals, a little bank couldn’t sell enough TruPS to attract an investor. The CDOs, by contrast, pooled diverse TruPS from around the country to limit the risk of default for the entire CDO. Citigroup, Merrill Lynch & Co., Credit Suisse Group AG and other investment banks sold $60 billion of TruPS CDOs from 2000 to 2007. That year, the housing bubble popped, the mortgage market collapsed, and banks -- especially smaller ones -- began to look like dead lenders walking. Jefferson’s Hildene started buying TruPS CDOs in May 2008, before the worst months of the financial crisis. His thesis was that fewer banks would fail than people thought and that the survivors would all have to repay their debts. If he was right, he’d make a killing. Jefferson lived on the West Side of Manhattan then, and he says before he started buying the supercheap TruPS CDOs he would walk his dog, Luna, around the American Museum of Natural History, asking himself, “What am I missing?” He concluded it was other investors who were failing to pick some low-hanging fruit. “If you did the work, you could understand it,” he says. One confusing feature of the securities: Banks are allowed to defer payments to debtholders at any time for up to five years. Prices plunged when banks deferred, because many investors assumed they had defaulted. Jefferson knew better and snapped them up. When the financial crisis deepened at the end of 2008, Jefferson kept buying TruPS CDOs, in some cases paying less than a penny on the dollar. Soon, they were all he bought. Then he learned that it wasn’t just buy and hold. When the worst of the credit crisis passed, other investors went trolling for TruPS. Instead of buying CDOs, like Jefferson, some tried to pry the best TruPS out of the CDOs at bargain prices, which would hurt investors such as Hildene. Banks also tried to buy back TruPS they had issued, offering pennies on the dollar. When forced to honor the debt, some banks pleaded hardship, saying they were too busted to pay off the TruPS, Jefferson says. He took a hard line: “If you’re going to live, you’re going to pay me,” he says he told them. He has gone to court multiple times to protect his investments. There are still cases pending. He says he and his staff watch the film “Braveheart” to get fired up. Today, Jefferson says he’s probably the biggest holder of TruPS CDOs. At a deep discount, the debt securities invented during the go-go years are a precious and rare commodity, he says. Jefferson and Craig-Scheckman say they always get the same question from investors: How long can they keep finding jewels among the wreckage of 2008? In Jefferson’s case, it could be a while. His TruPS could be paying dividends for another two decades because most have 30-year terms. Beyond that, he’s not fussed. Craig-Scheckman isn’t fretting either. As long as there are people concocting new financial products on Wall Street, no matter how smart they are, they will make mistakes, he says. And when he’s not skiing a foot of fresh powder on Triangle 3, a steep pitch in the trees at Steamboat Springs, he’ll be waiting for them. Assets and returns were for the 10 months ended on Oct. 31. The first step in calculating profits was dividing a fund’s net figure by 100 percent minus the sum of the management-fee and the incentive-fee percentages. If a fund didn’t report its fees, we used the average of funds in our universe: a 2 percent management fee and a 20 percent incentive fee. Using gross returns, we were able to reconstruct approximately what the assets were at the start of the year. Because we didn’t have inflows or outflows, the asset numbers did not take asset flows into account. We subtracted original assets from current assets and multiplied the result by each fund’s performance fee to derive the profit figures. Management fees aren’t included; we assumed they were used for the day-to-day operations of the fund. Several funds appearing on the most-profitable ranking do not show up on our lists of top performers. That is because the size of a fund can trump returns when calculating profits. Because hedge-fund returns can be difficult to obtain, our lists are not all-inclusive. In addition, some of the numbers were difficult to verify. Unless the information came from Bloomberg or the hedge-fund firm itself, we tried to verify it with other sources, including investors and other fund databases. Onshore and offshore assets and returns were combined for a number of funds, while figures for other funds were only for the larger or better-performing class of the fund. Please keep in mind the comments made at the end of the article and also there are many top funds which I track every quarter that are not on this list. But one thing is clear, some credit and quant funds did extremely well last year and if rates stay low and there is no fallout in the credit markets due to the plunge in oil, these funds will continue doing well this year (read my recent Outlook 2015 for more information). "We've seen significant moves in a number of markets, and trend followers have been able to take advantage of them," said James Skeggs, global head of the Newedge prime brokerage alternative investment advisory group (click on image below). Winning—and often contrarian—positions included the pattern of oil prices falling, the U.S. dollar appreciating versus most other currencies, and government bond interest rates declining. AHL profited from bond price gains in Italy, France and Sweden, the opposite of what many discretionary traders predicted given already-low interest rates, according to a person familiar with the performance. AHL also shorted crude oil as it tumbled and went long the U.S. dollar as it appreciated versus almost every other currency in the world given the country's relative economic strength. The strong performance last year was a reversal from the previous three, when the fund lost money each calendar year. AHL managed $13.4 billion as of Sept. 30 and is led by CEO Sandy Rattray. A spokesman for the firm declined to comment. The best performing manager appears to be smaller ISAM, whose flagship ISAM Systematic rose 62.4 percent in 2014, according to a spokesman for the firm. Lord Stanley Fink, the former CEO of Man, launched the now-$750 million strategy in 2010. The firm declined to comment on performance drivers. Another big winner was Aspect. The trend follower, led by CEO Anthony Todd, gained more than 32 percent during 2014 in its flagship $4.35 billion Aspect Diversified fund. The largest return driver was a bet against the future price of Brent crude starting in July, according to a spokesman. Oil prices fell steadily over the rest of the year. Another winner was a long position in government bonds as the fund caught the contrarian trend of interest rates declining (the value of bonds rises as yields fall). Leda Braga's BlueTrend fund also caught the rising bond price pattern in developed markets, as well as gains for the U.S. dollar, according to a person familiar with the situation. Braga's $7.8 billion BlueTrend gained 13.3 percent in 2014 through November, according to performance information obtained by CNBC.com. The fund was previously a unit of hedge fund giant BlueCrest Capital Management but spun out this month under Braga's new Systematica Investments. BlueCrest still has an undisclosed stake in the new firm, which has about 100 employees and more than $8 billion under management. "Systematic trading started 2014 as the least-loved asset class and has ended it as the best performing in part as a result of having positions opposite to the consensus," said Ewan Kirk, Cantab's chief investment officer. 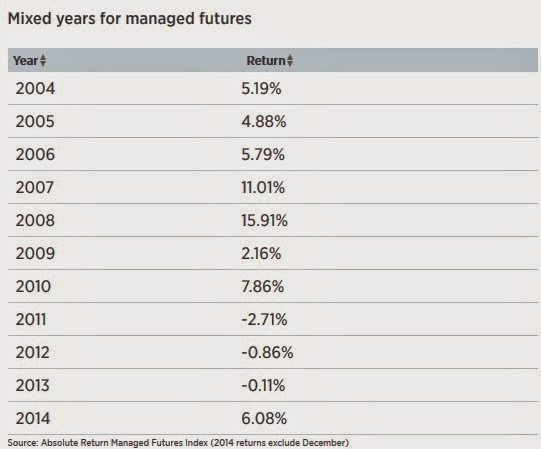 The success of managed futures comes after years of poor performance. Strategy practitioners complained that returns were hurt by the continued intervention of central banks in the economy, which made the prices of many types of securities relatively stable. They were also challenged by the low rate of return on cash because of near-zero interest rates (funds tend to have lots of cash on their books relative to other strategies because the futures contracts they invest with don't require that the full amount of the bet be paid upfront). 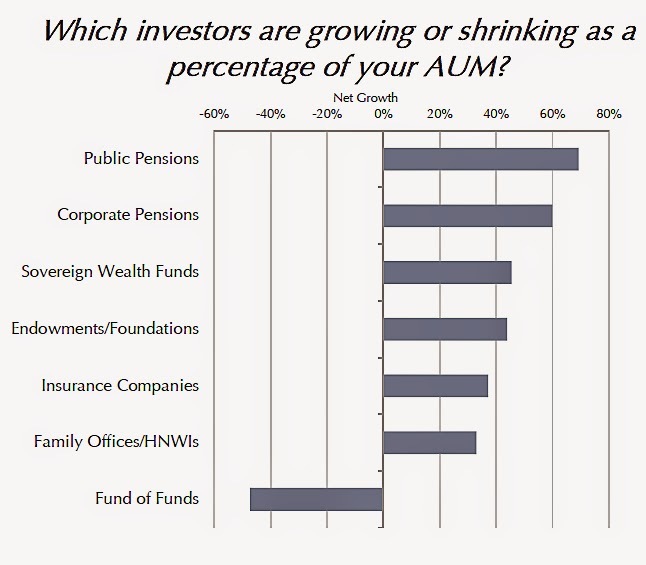 Losses at most funds in 2011, 2012 and 2013 meant that managers made little money for themselves (hedge funds can't charge a performance fee on a loss) and investors redeemed more than $18 billion from managed futures funds over the first three quarters of 2014, reducing assets to $312 billion, according to BarclayHedge. "People have been asking if CTAs are dead. This year has shown the answer to be a resounding 'no,'" said Newedge's Skeggs, referring to commodity trading advisors, another name for the strategy (click on image below). Not every managed futures fund made money. Jaffray Woodriff's Quantitative Investment Management (QIM) lost 8.74 percent through November in its main Quantitative Global Program. Other losing funds were those managed by Australia-based Kaiser Trading Group (down 0.13 percent) and Revolution Capital Management (down 14.5 percent). 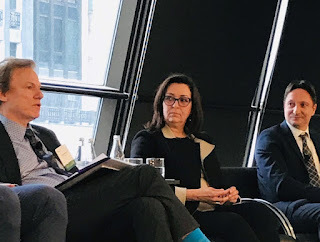 Jim Curley, a marketer at $538 million Revolution, said its losing Mosaic Institutional fund attempts to have no correlation with mainstream managed futures funds by taking a relatively short-term investing approach. In other words, longer term trends made the most money this year, but the fund wasn't set up to take advantage of them. 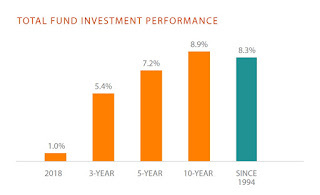 "Many of our clients have said that if our performance were to drift to being highly correlated to long-term systematic, they probably would redeem their investment. They bought chicken soup and don't want us to become beef barley," Curley said, noting the fund gained 16 percent in 2013 as others faltered. Kaiser CEO Tony Kaiser called 2014 results "disappointing" and blamed it on correcting markets in the first quarter of the year. He said tweaks to the fund's model improved performance over the rest of the year and added that combined with gains in 2013 (up 7.25 percent) the firm is in "a good position to move forward." A spokesman for QIM declined to comment. If trends in bonds, currencies, commodities and stocks continue, expect top-performing CTAs to have another great year, but if there is a major reversal in bonds, watch out, they will get killed (again, read my recent Outlook 2015 for more information). Apart from CTAs, some discretionary commodity funds that use fundamental analysis got the plunge in oil right and made a killing in 2014. Last week, Pierre Andurand of Andurand Capital shared his outlook on oil with my readers. My sources told me Andurand Capital is up 14% net in December, bringing the YTD net performance to +36% and assets under management are now around $400 million. Moreover, BlueGold Legacy investors are up 25% in 2013 and 44% in 2014 to date (+33% net annualized since 2008). The Nelson Report's list of other well-known commodity funds that also trade energy and with annual gains through October includes the $1.3 billion SummerHaven Commodity Absolute Return Fund in Stamford, Connecticut, which rose 7 percent, and the $200 million Merchant Commodities Fund in Singapore, which was up 27 percent. Those were rare bright spots in a commodity fund industry that's been steadily shrinking for several years. Funds going out of business this year include Houston-based AAA Capital Management Advisors, which will shut its doors and return investor money by the year-end after lackluster returns. The fund, at its peak, managed more than $2 billion, but now has less than $540 million under management. Brevan Howard, one of the world's biggest hedge fund managers, is closing its $630 million commodities fund, which was down about 4 percent through October, a source familiar with the matter said on Monday. Brevan Howard, one of Europe's largest hedge fund firms, saw its main $24 billion macro fund lose 0.82 pct in 2014, an investor letter showed, its first ever annual loss since launch in 2003. The Brevan Howard Fund Ltd lost 0.15 percent in December, according to a letter to investors obtained by Reuters, losing money in nine of the last 12 months in a tough year for peers. Macro hedge funds bet on major economic trends across a range of asset classes including stocks, bonds and currencies. The Wall Street Journal reports that Swiss Re is looking to sell a minority stake in Brevan Howard and the fund is still embroiled in legal disputes with star trader Chris Rokos, one of the co-founders now looking to start his own macro fund (Alan Howard should just let him go ahead!). Even though the return distribution across all seven strategies was in a tight range, as one would expect when the sample set only consists of 100 funds, what is interesting in Preqin’s research is that there is a significant disparity of performance between the benchmark and the best performing funds in strategies such as macro. As mentioned above, the top performing macro strategies returned 27.51 per cent. By comparison, the benchmark returned just 4.66 per cent. Clearly, within global macro there are some great funds, but plenty that are not so great. “Macro strategies aren’t a big focus for investors at the moment, despite market concerns. These figures show that one can find excellent macro funds but the overall benchmark is quite low suggesting that there are a good number of these funds that just aren’t performing well,” states Bensted. On the flip side, strategies such as Asset-Backed Lending, have a much tighter range of performance. The top funds in this category returned 21.76 per cent whilst the benchmark returned 11.76 per cent. There is a much higher chance of allocating to good quality ABL managers than global macro given that the gap between the best and the average performance is less pronounced. You should all read Preqin's comments on hedge funds by clicking here. Not surprisingly, they only find 3 of the top 100 performing hedge funds in 2014 featured in 2013's list (stop chasing after returns!!). Were there other big winners in the hedge fund industry in 2014? Yes, the Financial Times wrote an excellent analysis of five top hedge funds, including Bloom Tree Partners and MidOcean Credit Opportunity. Take the time to read this article. As you can see, public and corporate pension plans are by far the most important investors, with sovereign wealth funds in third place. Fund of funds are the only investors losing their share but I predicted this a long time ago. Why go with hot money when you can have sticky money as investors who are unwilling to pay for the extra layer of fees funds of funds charge? Critics love to hate hedge funds' relatively high fees, low performance and secrecy. But the industry is managing more money than ever—and is poised to grow even more in 2015. "Barring a large and unexpected global or financial event, hedge funds are positioned for another year of solid growth," industry data tracker eVestment wrote in a new report. The company predicts that investors will add about $100 billion or more to hedge funds in 2015, about the same as the $112 billion they added in 2014 to push assets to a record of about $3 trillion. The new money is mostly coming from big institutions, such as public pensions, university endowments and charitable foundations. Such investors are looking to so-called alternative investments like hedge and private equity funds to diversify their exposure away from already soaring stocks and low-yielding bonds. While there are about 10,000 hedge funds, the main beneficiaries will likely be large firms that already dominate, like Ray Dalio's Bridgewater Associates, Dan Och's Och-Ziff Capital Management Group and Cliff Asness' AQR Capital Management (read about Dalio's new strategy here). The average hedge fund hasn't produced huge returns in 2014, often as part of their risk-conscious design. The Absolute Return U.S. Equity Index, which tracks managers who invest in stocks, gained 3.74 percent net of fees in 2014 through November, but the S&P 500 index gained nearly 12 percent over the same period. The Absolute Return Credit Index is up 5.71 percent through November; the iShares Barclays Aggregate Bond Fund gained 3.93 percent. "We need to recognize that the long-term trend, driven by institutional portfolio allocation decisions, determines the industry's growth, while performance determines the near-term distribution of those assets," the eVestment report noted. Investors and their advisors are trying to figure out that mix now. 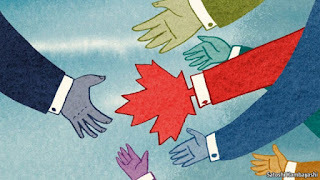 Tim Ng, chief investment officer of consultant Clearbrook Global Advisors, thinks the best-performing hedge funds for 2015 will be those that can take advantage of sharp market moves, such as U.S., Europe and Japan-focused stock-picking hedge funds, and differences in government economic stimulus policy, so-called "macro" or "relative value" strategies that trade government bonds, currencies and more. "Isolate hedge funds that benefit from increases in volatility and divergent central bank policies," Ng wrote in a 2015 outlook presentation. Justin Sheperd, CIO of hedge fund allocator Aurora Investment Management, also believes that coming volatility from reduced central bank market involvement will be good for money managers. "The combination of low intra-stock return correlation and increased dispersion of returns should create greater investment opportunities for hedge fund managers," Sheperd wrote in a recent outlook piece compiled by Natixis Global Asset Management. 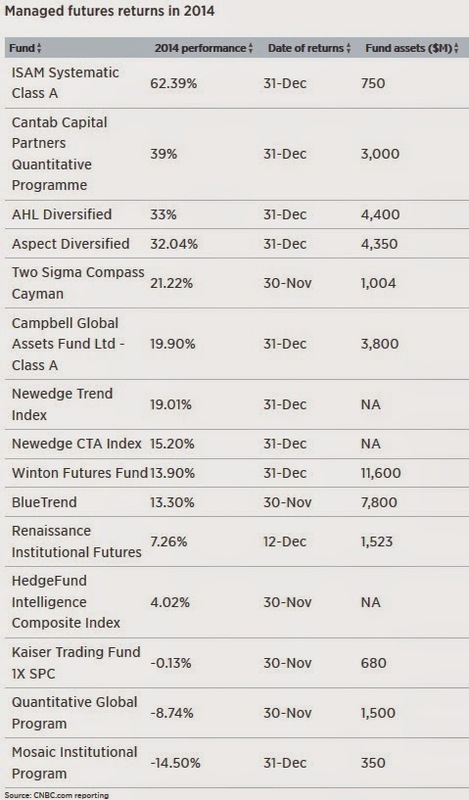 Alexander Healy, director of strategic research at investment manager AlphaSimplex Group, was also optimistic on hedge funds in the new year given the likelihood of increased volatility. 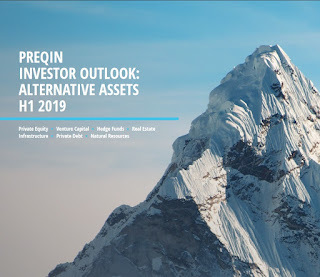 "Given the uncertainty around equities and bonds, we believe that alternative strategies, particularly those that are dynamic and can effectively manage risk, will be a more important part of investors' portfolios in 2015," he said in the Natixis outlook. Sheperd and Ng also recommended so-called event-driven hedge funds that can take advantage of corporate events given the likelihood of more mergers, acquisitions, management changes and the like. Activist managers, a subset of those funds, scored a series of high-profile wins in 2014.
Notable successes included Pershing Square Capital Management's bet on Allergan (which was sold to Actavis and netted Bill Ackman's firm about $2.2 billion); Starboard Value's involvement in Darden Restaurants (it took over the board with all 12 seats, and the stock has gained since); and Icahn Enterprises' play in Family Dollar Stores (the company is in the process of being sold, and Icahn netted a reported $200 million profit). Those victories came as the average event-driven fund gained just 2.56 percent through November, per the Absolute Return Event Driven Index. Below, The Wall Street Journal's Rob Copeland reviews this year's hedge fund winners and losers. He discusses the returns of Adage Capital, one of my favorite large L/S funds based in Boston that nobody talks about. You can track their portfolio and that of many other top funds here. Please remember to support this blog with your dollars by going to the PayPal buttons at the top right-hand side. I put a lot of time and effort to bring your the very best analysis on pensions and investments and appreciate your financial support. Thank you and have a great day!